Agrimony was traditionally used for gastrointestinal inflammation, ulcers, diarrhea, mucousy colitis and in particular for grumbling (chronic or subacute) appendicitis. Unlike powerful astringent herbs, like oak and witch hazel, agrimony is gentle and suitable for children's diarrhea and the elderly. It contains ellagitannins (agrimoniin) that impart its astringent action. Various flavonoids (apigenin, quercetin, luteolin) contribute to its antispasmodic and anti-inflammatory effects. Agrimony tastes bitter, and thus tonifys the digestive tract and supports the liver function. It has a reputation for being able to cure jaundice and other liver issues. It acts as a vulnerary to hasten wound healing and can be used both internally and topically. As a gargle, it aids ulcerations and infection in the mouth and throat including tonsilitis and aphthous ulcers. 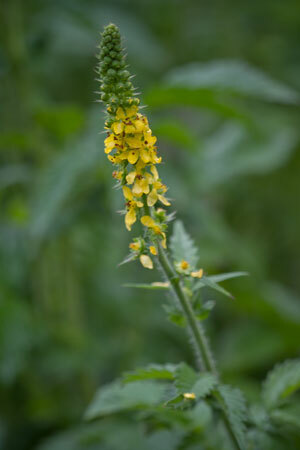 Agrimony acts on the urinary tract in several ways. Although it does have some mild antiseptic properties, its diuretic effect helps flush out urinary tract infections (UTIs) and gravel. It relaxes smooth muscles in the urinary tract to relieve renal colic and pain associated with the passing of kidney stones. The astringency also helps decrease inflammation and bleeding in the urinary tract, and even improve tone to help enuresis (bed wetting).